Windows Phone 8(WP8) is the second generation of mobile operating system developed by Mircrosoft to power the intelligent mobile devices. Now WP8 phones not only get a number of software improvements, but also bring support of updated hardware. This includes support for multi-core processors and high resolution screens, giving Windows Phone 8 based mobile phones the capacity to better compete against other Android and Apple phones. Besides watching the HD videos on WP 8 mobile phones, you can now make better use of your phone- play DVD on Window Phone 8 mobile device and enjoy the leisure time wherever you go with for your Nokia Lumia 920, Samsung Ativs S and HTC Window Phone 8 X etc. Despite that WP8 phones aren’t equipped with DVD drive like other portable devices; there is a feasible way allowing people to play DVD on Winodws Phone 8 mobile phone. That is, rip DVD to WP8 phone supported video. In this way, you may play DVD on Windows Phone 8 based mobile phone and enjoy the time in the metro, at airport and outdoors with no limitation. MacX DVD Ripper Pro is a professional DVD to WP8 phone software that gives you a simple and hassle-free way to copy DVD to Windows Phone 8 supported format WMV, MPEG-4 and MOV, making your Window phone more entertaining. This is an easy to use software that even the non-tech savvy people will be able to leverage it to rip protected DVD to Windows Phone 8 and play the DVD movie on Nokia Lumia 920, Lumia 820/925/ 928, Nokia Lumia PureView 808, Samsung S7/S6 etc. How to Rip DVD to WP8 Phone Using MacX DVD Ripper Pro? 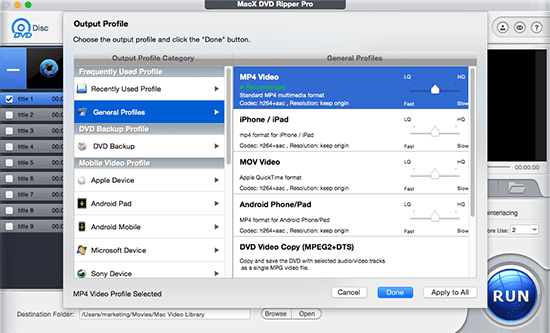 Run MacX DVD Ripper Pro and insert the disc to the DVD drive, click "DVD Disc" button to import the movie. If you have already saved the DVD as DVD folder on your computer, simply click "DVD Path" to load DVD folder. New DVD movie releases are also supported to rip. To rip DVD to Windows Phone 8 smart phone, please select "Microsoft Device", and then you will see all the popular WP 8 phones are listed there. Choose the WP8 phone you are using and click "Done" for confirmation. Step 4: Press the "Start" button. After all the steps are done, click the "Start" button and begin convert DVD to WP8 phone, you could view the conversion progress in real time. Once the software completes the process of DVD to Window Phone 8 mobile phone conversion, you will locate the converted video, transfer the movie to your device later and play DVD on Windows Phone 8 immediately. Tips: MacX DVD Ripper Pro is full-featured DVD ripping software, which not only works perfectly to rip and convert DVD to WP8 mobile phones, but also excels in ripping DVD to popular video formats for backup purpose. The fast DVD ripping speed is guaranteed for people to rip DVD to MP4, MKV, AVI, FLV, QuickTime, MOV, MPEG and all other video formats. To transfer DVD to iPhone iPad etc. users can download MacX MediaTrans to copy the DVD movie file to mobile devices in a click for free. It can also mount iPhone iPad etc. as USB drive to store DVD movie files. Notice: We only advocates using this best DVD ripper to rip commercial DVDs to WP8 mobile phone under the concept of Fair Use and does not encourage any illegal reproduction or distribution of copyrighted content. Please abide by the local DVD copyright law before doing it. Ever wondered to play DVD movies on Lumia 920 for enjoying them on the move? This tutorial shares the simplest way to copy and rip DVD to Lumia 920 or 820 friendly format like MPEG4 or H262 with utmost quality. If you are dwelling on how to convert DVD to the new iPad Mini, you are in the right place. This step-by-step guide is about ripping DVD movies to iPad Mini with high quality.